Testing teams are constantly under pressure to reduce development time without compromising quality. Traditional methods of quality assurance fail as they just cannot keep up with the challenges in constantly delivering software that is time-bound, robust and efficient. This has prompted more and more companies to lean towards the idea of establishing a centralized testing service. What is a Testing Center of Excellence? A testing center of excellence (TCoE) is a framework where testing is maintained as a centralized service and shared across the organization. Your QA is aligned to project goals rather than the organization goals – In the absence of a centralized testing framework, the testing teams report to individuals and hence do not share a common goal or direction. TCoE consolidates all testing functions under a single umbrella so that they operate towards a common goal which is, in turn, aligned towards the mission, vision and goals of the organization. This serves to add more clarity and visibility to QA in the eyes of the top management. 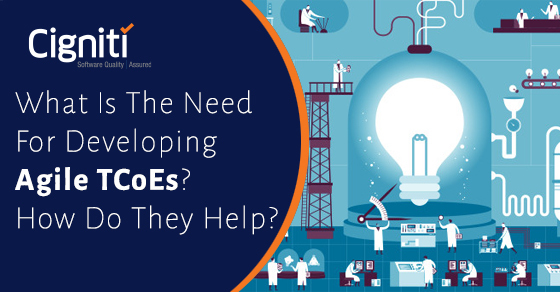 Finding testing resources with desired technical and domain skills is a challenge and hence, projects suffer from high training costs – In a traditional QA set up, there is limited cross project visibility due to which resources are not utilized optimally. Under TCoE, testing resources are organized on the lines of technology and LOB as per their core skills which aids in proper deployment of resources across projects. Your QA process is not transparent. In other words, you are not sure how much ROI you get out of your QA process. Without a TCoE, there is no efficient tracking of how much an organization has invested into testing and how much return has it generated. TCoE introduces metric based tracking which measures the success of the QA process in terms of test coverage, test effort, defect slippage, test effectiveness etc. and the ROI on testing. You desire to reduce your testing time without compromising on quality – With TCoE, you can achieve a mature QA with standard tools and frameworks resulting in a more efficient test cycle. Organizations with TCoE in place show an average reduction of up to 30% in the testing cycle which considerably reduces the time-to-market. 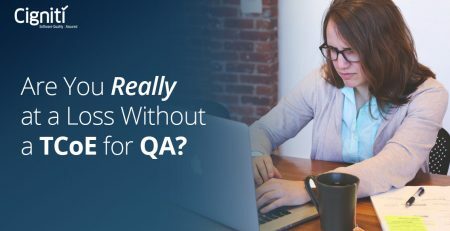 You do not have a standard QA process and there is no sharing of best practices, tools and automation opportunities across teams at an organization level. Unnecessary time and effort is spent on reinventing the wheel each time. TCoE standardizes testing processes throughout the organization and sets guidelines for test planning, test scripts and test execution. It facilitates sharing of best practices, lessons learnt and automation opportunities. This leads to a reduced learning curve and eliminates chaos arising from variation in testing across projects. Your projects are often struggling with issues related to defect leakage and missed deliveries – With TCoE, organizations have been able to achieve up to 50-70% level of automation in testing with an average of 30% reduction in test cycles and limit defect leakage to less than 2%. Your organization is not aware of new trends in testing. There is no focus on emerging technologies and you do not possess the framework necessary to test them. A TCoE structure helps QA to be more business oriented. It is in sync with new technologies and trends in testing which gives the organization a competitive edge and empowers it to respond quickly to new business opportunities. Organizations that have adopted TCoE have reported an average cost reduction of 35% over a 3-year period. Some of the other benefits of TCoE? It brings in more agility to QA and helps to establish a continuous improvement process driven by metrics. Setting up a TCoE does require certain amount of change along with support and commitment from the top management. But you always have the option of partnering with a company that already has TCoE capability. 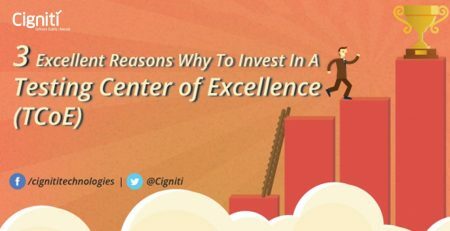 Read about how Cigniti’s TCoE can help you transform your testing functions.